The Leaders of the North Bay Awards recognize leaders who live or work in the North Bay in five categories. These exemplary leaders are beacons of hope for those who seek stronger, more resilient communities. 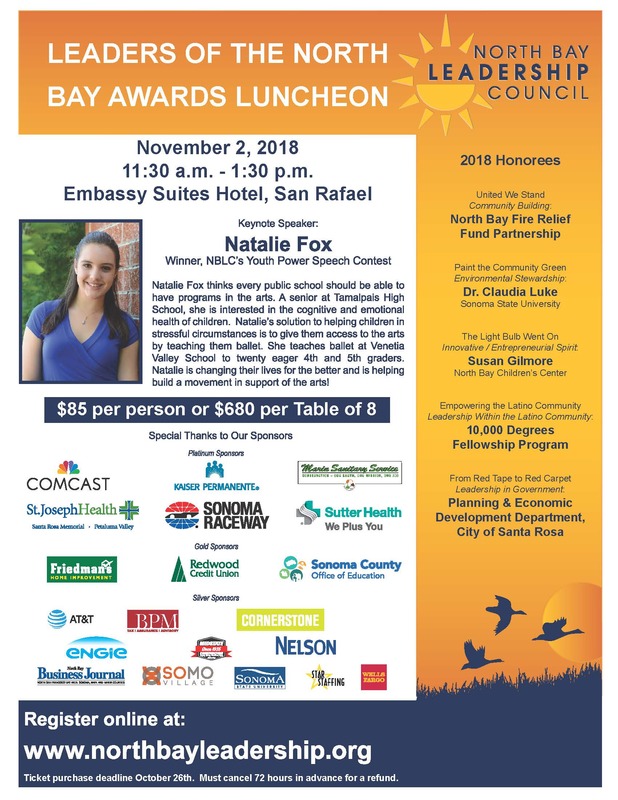 The awards luncheon and ceremony will be held on Friday, November 2 at 11:30 a.m. at the Embassy Suites Hotel, San Rafael. The keynote speaker will be teen leader, Natalie Fox, the winner of the Youth Power Speech Contest. We promise you an exciting, uplifting event that will be very memorable. The awards luncheon sells out every year so please purchase your tickets early to guarantee a seat. Tickets are $85/each and may be purchased online Here. If you are interested in a sponsorship, please contact info@northbayleadership.org.